This will be the garden post. 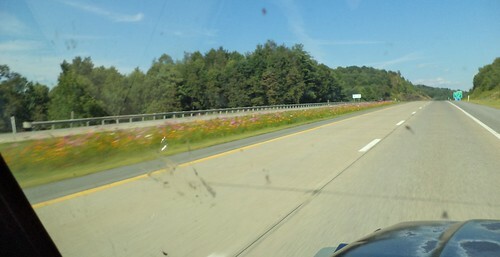 It started with wildflowers in the median on Interstate 64 heading east into the mountains. There were cosmos but I'm not sure what the others were. The pinks contrasted very nicely with the oranges. It's a wonder more states don't opt to put wildflowers in the medians. You remove the need to mow and it looks good. I did think, that with the drop in butterfly populations in Illinois this year, the deaths of a lot more butterflies could come as a result of planting attractive flowers in the medians. I'd like to know why this isn't done more. It makes the drive nicer, too. At around 6:30 p.m. on the 15th, I made it out of West Virginia and into Virginia. I stopped at the first welcome center in Virginia to call Carole with an eta. It was still a good 3 hour drive before I'd be in Richmond. I was struck by the floral display outside the welcome center. It was a riot of colors and plants. 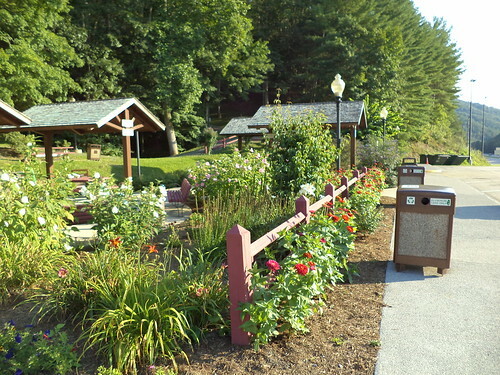 These tall plants effectively provide a bit of a screen to the picnic tables nestled between the parking lot and the back hill. They provide a bit of peace. 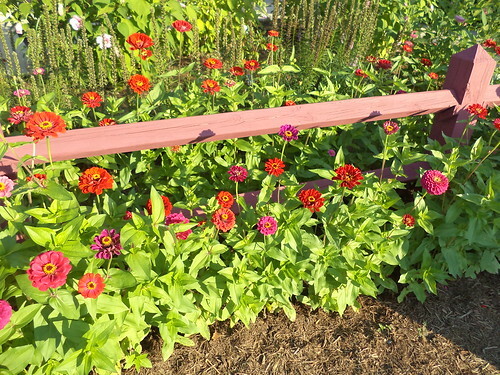 What I really liked were the zinnias. I love zinnias. They come in a wide array of colors and types, from low growing edge plants to these nearly 3 foot tall border plants. The colors were amazing and are not done justice by my camera. The orange of the evening sun makes them more orange than they were. There were dark reds, dark fuschias, and dark oranges mixed together. The effect was very striking. I'd love to have a bed of these or have these lining the walk up to the house. On Sunday, August 18th, we went into Washington DC. My one claim to being in DC was having to change planes at Dulles on the way back from England in 1996. I really can't say I've been in DC. You can't say you've been in Chicago if your only visit was to change planes at O'Hare. That's not Chicago. Neither is Dulles DC. It's a 2 hour drive from Richmond to the Metro station and then, it's a half-hour train trip into the heart of the city. What I saw is for another post, but what I want to note here is another plant I would love to have in my yard. This one, however, is not hardy in the Chicagoland environs. Not sure what this is? It's a holly genus. This one doesn't have the real spiky leaves we associate with Christmas holly, but the sign in front of it said, "holly". 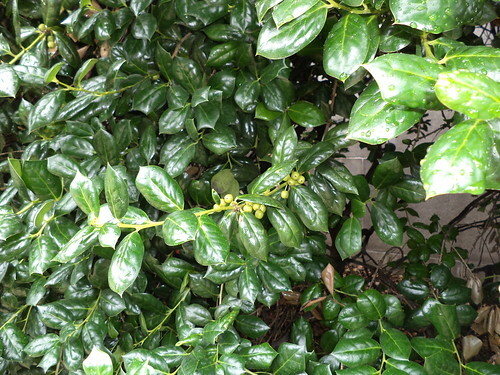 I love the look of a holly bush, particularly in the fall and winter. The red berries contrast with the green leaves and the whole thing looks so festive. But holly won't survive our northern winters, even with global warming. The prospect of bitter temperatures and wind chills will kill this plant. It will also kill this magnificent tree. 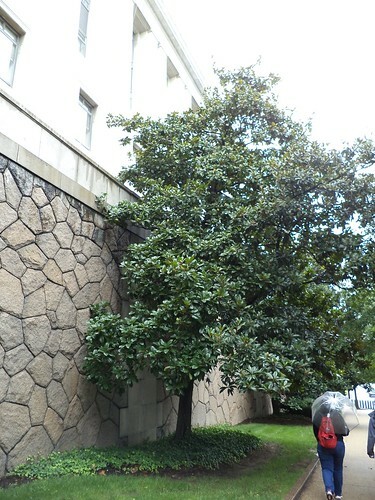 This is a Southern magnolia. Up north here, we have these trees flowering in the spring. 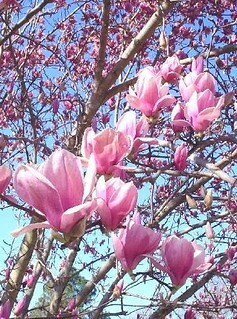 These are "tulip trees" or sometimes called "Japanese magnolias". The thing is, a Southern magnolia would not survive up here. It's decidedly a southern tree. They will lose their leaves in the fall, but they don't burst into a riot of pink in the spring. Rather, they have large white blossoms, sometimes the size of a dinner plate, intermittently throughout the spring, summer and fall. Way far south, they can bloom all year if weather conditions are right. The scent of a Southern magnolia is intoxicating. I'm not sure if the Japanese magnolia has a scent. I always enjoy the look on a Southerners face when someone from the north points to the blossoming pink tree and says, "See how the magnolia is in bloom this year." They aren't technically incorrect. It's just a different species. We went to the US Botanical Gardens, which were past the magnolia up above. I'll leave that for a separate post.